I was savoring my walk to the shop today. The sun was grinning and I thought: “I should do this regularly, stroll Makati, lap up on some sunshine.” Puff! Blasting black smoke, appeared out of the already thinning air, and I lost my sunshine. The jeepney greeted me with fumes for a smile, trailing clouds of smog in its wake. “Goodbye” he said. “I cannot see you now.” And my sanity vanished in the blanket of black. Can’t anyone walk in Makati anymore? Silly how we panic when someone coughs in the elevator, fearing that the virus would get transmitted and claw its way into our throats. But that smoke-belcher we see (or not see) everyday? They cough up clouds of smog into the air we breathe. And we ingest it. And it’s worst than any virus. It would be like being stuck in an elevator everyday whilst a man coughs up carbon monoxide (among others) that surely claws its way into our throats. I’d rather have a virus visit and leave me than have smog kill me softly, and silently too. So I read up on smoke pollution in Makati. The air over Makati, exceeds the acceptable level of 230/TSP/microgram. The Total Suspended Particulates (TSP) is 270 over Makati. That means that while writing this piece in Makati, I take in 40 more of the shadow killer. Now, according to the World Health Organization (WHO), the levels of lead in Manila are more than three times the established safety limit. Three times against what is safe? That means we’re breathing in air that is not only hazardous, it’s THREE TIMES hazardous. Now who in his right mind would keep doing that? 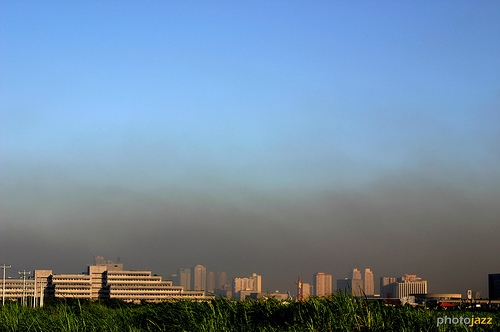 The WHO report grants Metro Manila as the fourth most polluted worldwide. Isn’t that grand? Our country counts the fourth highest for something, and it is air pollution. And while we’re taking 4th highest honor in and out our lungs everyday, our government enacted the Clean Air Act in 1999. I didn’t know we had an action plan for clean air because obviously, it is being ignored. The regulatory agencies do not strictly implement its provisions. For what excuse I am baffled, as surely they would not trade health for wealth. Right? Not. Still, all you have to do is look out your window and step outside- puff there goes a jeep and puff the law ignored. And the fines? A hundred pesos by the LTO. Not even enough for one mask. Two thousand Pesos for the first offense and P6,000 for the third. Too low for my lung’s worth. So what am I to do? Live elsewhere. Stay inside. Wear a gas mask. Lose any semblance of life. But then again, life’s being puffed away by the shadow killer regardless. I’m going to step outside again. Time for lunch and time to drink in some more carbon monoxide. What a depressing trade-off for sun and a stroll in Makati. great article!! wish this reaches the noses of the people in charge!! breathing clean air is a right and not a privilege!